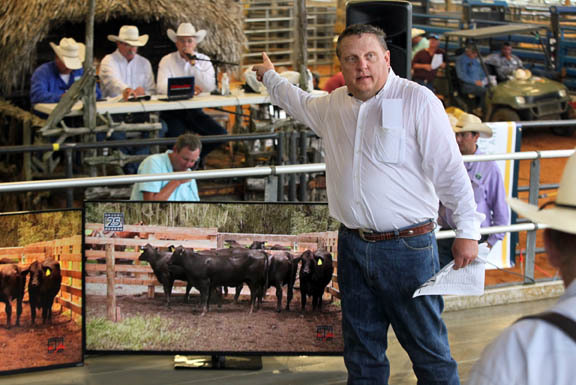 Cattle keepers buy, sell at Salacoa Seminole market | Seminole Tribe of Florida, Inc.
Richard Hood, of American Marketing Services, hustles as he handles the high-energy auction floor Oct. 10 during the Cattle Country Replacement Female Sale at Fred Smith Rodeo Arena in Brighton. BRIGHTON — Salacoa Valley Farms, a division of the Seminole Tribe of Florida, Inc., hosted its first cattle auction on Seminole soil before an ample crowd eager to buy and sell. The Oct. 10 Cattle Country Replacement Female Sale at Fred Smith Rodeo Arena in Brighton featured 530 head of bred (pregnant) heifers and plenty of ready-to-breed but never-impregnated (open) heifers. All were commercial cattle either seed stocked by Salacoa Brangus bulls or crossbred with Salacoa bulls. “You talk about calf-raising mommas, we got ’em right here,” called Mark Cowan, of American Marketing Services (AMS), one of the nation’s leading cow and bull sales management teams, to the audience of buyers. Cowan sat at the auction table between event auctioneer Tommy Barnes and Alex Johns, who oversees the Tribe’s cattle program and the Salacoa operation. Seminole Pride is the Tribe’s brand under the Seminole Tribe Board of Directors, which purchased the Georgia-based Salacoa Valley Farms in December 2013. At 4,500 acres, Salacoa is the fourth-largest purebred Brangus ranch in the United States. Johns, who also serves the Florida Cattlemen’s Association as its second vice president, said the customer appreciation event generated $1,288,850 in sales. “It’s the biggest sale the Tribe has had in Florida. Our goal is to eventually have the biggest sale in the state,” Johns said. Buyers were about 50-50 Tribal member cattle ranchers and other ranchers from Florida and out of state. The two-hour event was broadcast live on the rural RFD-TV cable network and live-streamed via Internet at DVAuction.com. The online auction company boasts 93,000 registered viewers. More than a dozen auction staff workers fielded online absentee bids, telephone call-ins and live audience bids. Hammer prices for bred Brangus heifers ranged from $2,700 to $4,000. Some open, ready-to-breed heifers sold for $1,700 or higher. Wes Williamson, owner of Williamson Cattle Company in Texas, Alabama and nearby Okeechobee, sold about 200 head. “We sold a bunch of heifers all bred by Salacoa bulls. Seminole Pride is the best and the word is spreading,” said Williamson, who attended the auction with his wife, Darin, and grandson Brady, 7. But raising Brangus is not new to the Tribe. Johns said tribal cattle owners began breeding the cross between Angus and Brahman cattle in the 1940s. A concerted effort to build the Seminole cow/calf operation with Brangus cattle began about two decades ago. “We know Brangus works because we have the research … but what works in Florida doesn’t work for the boys in South Dakota,” Johns said. Brangus have proven especially resilient to subtropical heat and humidity. They are strong foragers and rapid weight gainers; resistant to fleas, ticks and bloat; hardy and nurturing mothers; and produce leaner and thicker, yet tender and tastier, meat. Salacoa general manager Chris Heptinstall said science is behind the high-quality product. Armed with a degree in animal sciences from Auburn University, Heptinstall has more than 20 years in the business. Seminole Pride Beef cuts, ranging from inside rounds and peeled knuckles to top blades and Brazilian picanha steak, are sold at Broward Meat and Fish Co. supermarkets in North Lauderdale and Lauderdale Lakes and served in more than 200 restaurants nationwide. Heptinstall said initial breeding decisions make all the difference in the commercial cattle beef industry. Superior genetically produced offspring, called progeny, could take up to five years to engineer. Brangus is five-eighths Angus and three-eighths Brahman. Typically, Brangus heifers are impregnated at about 2 years old and are able to birth a calf every year. New calves feed with their mother for about six months before they are sent to a feedlot. About a year later or less, when they reach about 1,300 pounds, they are slaughtered for beef. In the case of Salacoa and Seminole Pride Beef, live cattle Brangus rib-eye sections are tested by ultrasound to determine the percentage of its intramuscular fat (IMF,) where taste derives. IMF relates similarly to the degree of marbling in the meat and fat. “We average 4 percent IMF. It’s through the IMF program that we can correlate carcasses back to the [parents],” and in turn re-ensure that progeny continues and improves, Heptinstall said. The heifers sold at the Brighton sale were the best in Florida cattle country, said Richard Hood, a veteran cattle genetics executive of AMS who fielded bids from the auction floor. “This is cattle country in Florida, right here in Brighton and Okeechobee, with the largest ranches and some of the best genetics in the United States,” Hood said. According to the National Cattlemen’s Beef Association’s most recent industry report, Florida cow-calf operators take four spots in the nation’s top 10 list. The Seminole Tribe’s combined operations in Florida and Salacoa ranks seventh. Meanwhile, the U.S. Department of Agriculture ranks Florida 10th in the nation for beef cow population. The state’s top eight cow inventory counties include Glades and Hendry counties where Brighton and Big Cypress reservations are located, respectively. Johns said he aims to continue building and expanding the Seminole cattle business. Interest in forging a cooperative venture with other Florida cattle operations is growing. About 20 recent buyers were potential co-op members. Heifers from the recent sale were replacement females for reproduction only. “We’re trying now to build the brood stock base to produce even more cattle,” he said. Johns hopes to eventually host a cattle sale that will feature 1,000 head or more. The takeaway message of the October sale sounded good news for the future, Heptinstall said. Buyers who were already customers of the program were provided first dibs on the choicest and most premium heifers available.